Charles with President Ronald Reagan and First Lady Nancy Reagan in 1984. Ray Charles, born Ray Charles Robinson (September 23, 1930 – June 10, 2004), was a pioneering American pianist, musician and entertainer who, by introducing gospel forms into secular music, helped lay the foundation for Soul music. Charles would also apply his signature vocal delivery to everything from country music to pop standards over the course of his five decade-long career, achieving worldwide fame and recognition. By the time of his passing he had become an American musical icon. Struck blind at the age of seven, Charles found his vocation as a rhythm and blues artist early in his life. For much of his adult years Charles struggled with a heroin addiction, which he eventually overcame. His relationships with women were often exploitative; twice married, he fathered 12 children by 7 different women. Like most African-American musicians, Charles experienced racism and was sometimes criticized for not speaking out more. Yet through his groundbreaking artistry across musical genres Charles broke down barriers of race and prejudice and won worldwide acclaim. In a testimony to Charles' cross-racial appeal, his hit song "Georgia on My Mind" was the named State Song by Georgia's state legislature in 1979. Ray Charles Robinson was born out-of-wedlock in Albany, Georgia to Bailey and Aretha Robinson. His family moved to the small Northern Florida hamlet of Greenville when he was only a few months old. Ray’s father was not a significant part of his life as he worked and had two more families, leaving Ray’s mother to raise the family with the aid of his father's first wife, Mary Jane. When Ray was five years old, his younger brother, George, who was about four, drowned in an outside tub. Ray witnessed him fall and tried to pull him out, but was unable to save him. Ray began going blind soon after the traumatic event and was totally blind by the age of seven. The cause is generally believed to be undiagnosed glaucoma. He attended school at the Florida School for the Deaf and the Blind in St. Augustine, as a state-sponsored charity case; he learned how to read Braille, as well as to write music and play various musical instruments, focusing on the piano. After he left school, Charles began working as a musician in Florida in several bands that played various styles of music including jazz and country. After both of his parents passed away, he moved to Seattle, Washington in 1947 at the age of 17, where he began to make a name for himself in clubs, playing in the jazz-blues trio format. It was around this time that he began to go by the name Ray Charles to avoid association and confusion with boxer Sugar Ray Robinson. He soon started recording, first for the Downbeat label (later known as Swingtime), achieving his first hit songs with "Confession Blues" (1949) and "Baby, Let Me Hold Your Hand" (1951) before signing with Atlantic Records in 1952. With Atlantic Records, Ray Charles found the perfect setting for his blossoming talent, and quickly began to reap the rewards. Charles scored his first Atlantic hit in 1953 with the release of the Ahmet Ertegun-composed "Mess Around" single, and had another hit with his version of "It Should Have Been Me," but his career went into high gear with 1955’s "I Got a Woman." A seminal moment in the emergence of soul music, “I Got a Woman” was a rewording and reworking of the gospel tune, “Jesus is All the World to Me.” Charles followed it up with "This Little Girl of Mine," also recorded in 1955, and "Drown in My Own Tears," "Hallelujah I Love Her So," and "Lonely Avenue," in 1956, all big hits on the R&B charts. His style in this period defined early soul, revolving around gospel songs converted with secular lyrics, and blues ballads. An essential document of this phase of his career is the live album Ray Charles In Person (originally titled What’d I Say, now available bundled with Ray Charles in Newport as Ray Charles Live), recorded from a concert held before a mostly African-American audience at Herndon Stadium in Atlanta, Georgia on May 28, 1959. The album marked the first recorded appearance of “What’d I Say,” Charles’ break-out crossover hit. “What’d I Say” was a song originally created by spontaneous improvisation at the end of a late-1958 or early-1959 show when Charles had finished his scheduled set with twelve or so minutes to spare. Eventually, after being re-recorded in New York and masterfully pared down from its epic ten-minute-plus length and split into two parts for release as a single, it would reach #6 on the Billboard Pop Charts. The song’s application of gospel-style call-and-response vocals to earthy, sensuous moaning is perhaps the best and most well-known example of Charles’ edgy approach to blending sacred and secular musical forms. In 1959, Ray moved from Atlantic Records to ABC-Paramount, signing an extremely favorable contract that afforded him a production deal, profit-sharing and eventual ownership of his masters. Ray had already begun to show interest in making music beyond the limits of the blues-gospel synthesis while at Atlantic Records. At ABC Records he was given a great deal of control over his music, broadened his approach to more straightforward pop music, while maintaining his soulful R&B approach, resulting in such hits as "Unchain My Heart," "You Are My Sunshine," and the #1 hits on the Billboard pop charts, "Georgia On My Mind" and "Hit the Road, Jack." In 1962, Charles surprised his new, broader audience with his landmark album Modern Sounds in Country and Western Music, a groundbreaking combination of soul and country music that went to #1 on the album charts and included the numbers "I Can't Stop Loving You" (which itself went to #1 on the singles chart) and "You Don't Know Me." In 1961, Charles canceled a concert scheduled to take place in the Bell Auditorium in Augusta, Georgia to protest against segregated seating. He wasn't banned from the state of Georgia as inaccurately claimed in the popular film Ray, though Charles did have to pay $800 compensation to the promoter. In 1965, Charles was arrested for possession of heroin, a drug to which he had been addicted for 17 years. It was his third arrest for the offense, but he avoided prison time after kicking the habit in a clinic in Los Angeles, California. He spent a year on parole in 1966. After the 1960s, Charles' releases were hit-or-miss, with some massive hits and critically acclaimed work, and some music that was dismissed as unoriginal and staid. He concentrated largely on live performances, although his version of "Georgia On My Mind," a Hoagy Carmichael song originally written for a girl named Georgia, was a hit and soon was proclaimed the state song of Georgia on April 24, 1979, with Charles performing it on the floor of the state legislature. He also had success with his unique version of "America the Beautiful." Film audiences enthusiastic for a soul music and R&B resurgence, fueled in part by the music performances of comic front men John Belushi and Dan Aykroyd in the April 22, 1978, episode of Saturday Night Live, snapped up albums, heavily requested Top 40 releases and swelled the box office take of summer 1980's The Blues Brothers. In one of the film's notable cameos, Ray Charles plays a blind music store owner and offers a lively "Shake Your Tailfeather." Then in the late 1980s, a number of events increased Charles' recognition among young audiences. In 1985, "Night Time is the Right Time" was featured in the episode "Happy Anniversary" of The Cosby Show. The cast members used the song to perform a wildly popular lip-synch that helped the show secure its wide viewer-ship. In 1986, he performed his rendition of "America the Beautiful" at WrestleMania 2. Charles' new connection with audiences helped secure a spokesman-ship for Diet Pepsi. In this highly successful advertising campaign, Charles popularized the catchphrase "You Got the Right One, Baby!" As well, Charles made appearances on "The Super Dave Osbourne Show," where he performed and appeared in a few vignettes where he was somehow driving a car. At the height of his newfound fame in the early nineties, Charles did guest vocals for quite a few projects. He also appeared (with Chaka Khan) on long time friend Quincy Jones' hit "I'll Be Good To You" in 1990, from Jones' album Back on the Block. Charles performed his classic "Georgia On My Mind" during the Opening Ceremonies of the 1996 Olympic Games in Atlanta, Georgia. In 2002 Charles headlined during the Cognac festival in southern France. At one point in the performance a young fan rose to his feet and began to sing an acappella version of Charles' early song, "Mess Around." Charles adored this show of respect and bravery and decided to show this fan his admiration by playing the song. One of Charles' last public performances was in 2003 at a televised annual electronic media journalist banquet held in Washington, D.C. He performed "Georgia On My Mind" and "America the Beautiful." 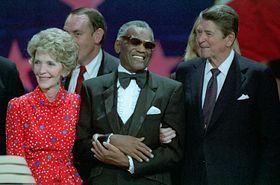 Ray Charles' final public appearance came on April 30, 2004, at the dedication of his music studio as a historic landmark in the city of Los Angeles. He died at age 73 on June 10, 2004 (11:35 a.m.) of liver disease at his home in Beverly Hills, California, surrounded by family and friends. He was interred in the Inglewood Park Cemetery in Inglewood, California. His final album, Genius Loves Company, released two months after his death, consists of duets with various admirers and contemporaries: B.B. King, Van Morrison, Willie Nelson, James Taylor, Gladys Knight, Michael McDonald, Natalie Cole, Elton John, Bonnie Raitt, Diana Krall, Norah Jones, Idina Menzel, and Johnny Mathis. The album won eight Grammy Awards, including five for Ray Charles for Best Pop Vocal Album, Album of the Year, Record of the Year and Best Pop Collaboration with Vocals for "Here We Go Again" with Norah Jones, and Best Gospel Performance for "Heaven Help Us All" with Gladys Knight; he also received nods for his duets with Elton John and B.B. King. Charles was significantly involved in the biopic Ray, an October 2004 film which portrays his life and career between 1930 and 1966 and stars Jamie Foxx as Charles. Foxx won the 2005 Academy Award for Best Actor for the role. Before shooting could begin, however, director Taylor Hackford brought Foxx to meet Charles, who insisted that they sit down at two pianos and play together. For two hours, Charles challenged Foxx, who revealed the depth of his talent, and finally, Charles stood up, hugged Foxx, and gave his blessing, proclaiming, "He's the one... he can do it." Charles was able to attend a showing of the completed film, but he died before it opened in theaters. The film's credits note that he is survived by 12 children, 21 grandchildren, and five great grandchildren. Many of today's artists continue to honor the legacy of Charles. The 2005 Grammy Awards were dedicated to him. In August 2005, the United States Congress honored Charles by renaming the former West Adams Station post office in Los Angeles the "Ray Charles Station." Despite his support of Martin Luther King, Jr. in the 1960s and his support for the American Civil Rights Movement, Charles courted controversy when he toured South Africa in 1981 in breach of an international boycott of the country because of its apartheid policy. A notorious ladies' man, Charles was married twice and fathered twelve children by seven different women. His first marriage, to Eileen Williams on July 31, 1951, resulted in one child and ended in divorce in 1952. Three additional children are from his second marriage, on April 5, 1955, to Della Beatrice Howard Robinson. She was not one of his original Raelettes. Their marriage ended in divorce in 1977. In a 60 Minutes profile, he admitted to Ed Bradley that he "auditioned" his female back-up singers. The saying was, "To be a Raelette, you've got to let Ray." From the time of his switch from straight rhythm and blues with a combo, Charles was often accused of musically "selling out." He left behind his classic formulation of rhythm and blues to sing country music, pop songs, and soft-drink commercials. Yet in the process, he went from a niche audience to worldwide fame. In addition to winning dozens of Grammy Awards in his career, Charles also received numerous other honors. In 1976, he became one of the first honorees of the Georgia Music Hall of Fame, who recognized him as a musician born in the state, a full three years before his version of "Georgia On My Mind" was made into the official state song. In 1981, he was given a star on the Hollywood Walk of Fame and was one of the first inductees to the Rock & Roll Hall of Fame at its inaugural ceremony in 1986. In 1991, he was inducted to the Rhythm & Blues Foundation, and in 2004 he was inducted to the Jazz Hall of Fame. All links retrieved May 8, 2013. "Ray Charles Helped Integrate Birmingham" A blog post on HungryBlues presenting historical documents about the role Ray Charles played in the Civil Rights Movement in Birmingham, AL, 1963. This page was last modified on 8 May 2013, at 14:28.